PIERMONT, N.Y. — This Hudson River village just north of New York City is where the Normandy Day landings were staged, literally. It was from the pier here that U.S. Army soldiers and their units gathered to be taken to the large ships at New York and then across the Atlantic to England, to the Channel, to the historic World War II battles. Earlier, others had left for the North African and Italian campaigns. There is a statue of “G.I. Joe” in this community, and we are reminded every time we pass of the great sacrifices offered by the 1.1 million men who walked through Piermont 1943-45. As a newspaperman some years ago, I was privileged to offer remarks standing next to Joe, not as tall as he, not even as humble, but in sincerity. I repeat them now in his honor, in the honor of all our veterans of all our wars and conflicts and for those who serve(d) in peacetime, too. “We are not alone here, at this corner, on this Memorial Day. In our humble tribute, we are surrounded and saturated by the spirits of the good people who marched by in 1943, ’44 and ’45. • The young man from Wisconsin who saw his mother’s face on a woman he did not know, sitting on her porch off Paradise Avenue as he passed. Soon enough he would be with the 36th Infantry Division at Cassino, and the images of the two women would become one, warming his soul in the cold of battle hell. • The fellow from Camden, New Jersey, brought to Camp Shanks in the middle of the night on a troop train, who a few weeks later would ride on a transport driven to the Piermont Pier by one of the many women of the home war effort. Maybe he recalled her deft steering of the deuce and a half when he saw the Red Ball Express materiel delivery teams after the breakout at St. Lo and the race to the Rhine. • The two brothers who last touched American soil at Piermont, one off to the U.S. II Corps at the Kasserine Pass and the other with the 45th Infantry at Ragusa, Sicily. Only one son would make it back to this good earth. • The older man, a private anyway, who was not drafted but who joined and became “Pop” with the 106th Infantry at the Battle of the Bulge. The calm hills over Piermont, one of his last sights of America, were in his mind in bitter cold, snowy woods of that awful blitzkrieg December. • The fellows who shaped up at Shanks for the 32nd Field Artillery and the First Medical Battalion, units that saw a quiet U.S. sendoff and then the shouting, cataclysmic horror of D-day and D-day plus one. • And all the men, almost all civilian soldiers, once machinists, salesmen, the unemployed, farmers, professional workers, sons and fathers, neighbors and strangers, immigrants and Native Americans and all whose forebears came to this nation free or not. They are the spirits who once moved as humanity through this Piermont, past this spot where the inanimate but full-of-life G.I. Joe statue gives constant nod to their service, their courage, their sacrifice, their protection of one another. This scene of continual reverence plays not only on this Memorial Day in Piermont, but on every day of the year, in every year, in every small and big town in these United States. Not one community has been left untouched in the world wars, by the Korean and Vietnam wars, and now by Iraq. Wars are fought by the then living and endured for decades afterward by the survivors. The memorials we erect to those gone are in worthy and humble tribute and comfort the living, but it cannot end there. You hear such voice still, here in Piermont, from the one-million-plus spirits who passed through to the European Theatre of War. They will never stop speaking, in this village and in all of this America. NYACK, N.Y. — This village a bit north of New York City and west of the Hudson River has long been recognized as part of the famous “Underground Railroad,” the network of secret trails, safe houses and courageous people across color who helped slaves escape in the 1800s. Now, thanks in part to activist Bill Batson, who is also an artist/writer, what has been known locally will both be recognized with a sitting place and given national publicity. Bill, rightfully proud of his long-integrated community with such a rich heritage of families living and working together, has helped bring author Toni Morrison to Nyack as guest speaker for the dedication of a bench in Memorial Park. The sitting place, one for reflection against a beautiful river view, is the 15th latest “Bench by the Road,” a project of the Tony Morrison Society. In 1989, the Nobel-winning author who has a home in neighboring Grand View, described what she saw as the insufficient placement of enslaved Africans and their descendants in our nation’s history. She would write “Beloved,” her famous novel, to detail and bring life to that history. Specifically in Nyack, the facts show that the village played a vital role in the Underground Railroad through the efforts of conductor/safe house operator Cynthia D. Hesdra (1808-1879). So began the benches by the road, thanks to the author, donors and volunteers like Bill Batson, who has been working on the Nyack project since 2010. The initial bench was placed in South Carolina, at Sullivan’s Island in 2008, where slaves first set foot in the western world. Other benches are found in sites historical to slaves and their freedom journey. In Nyack, where the latest sitting place will be dedicated Monday, May 18, with ceremonies beginning downtown at 2:30 p.m. and speaking by Morrison later in the park, the reference to Hesdra will be furthered and made deeper. A state historical marker on Main Street has long noted the Underground Railroad and the Hesdra Family, and The Historical Society of the Nyacks as well as the Historical Society of Rockland County and the local newspaper, The Journal News, have made detailed reference to Nyack and the Underground Railroad for at least five decades. On a fine spring day — and we have had just a few of those in the Northeast this year since our old-fashioned, cold, snowy winter forced us into a long season of overcoats, only to shed them faster than Grant took Richmond when unusually hot periods with Georgia-like humidity blasted into town — on a fine, rare spring day, you are young again. There is a certain whiff of innocence in a new spring. It is a fresh start, and the successive seasons haven’t had their way yet. When I was a younger fellow, I caught this fragrance, though it is more than just a “pleasant, sweet” scent, on a road called McNamara in what was then unincorporated Ramapo township but is now the Village of Wesley Hills, N.Y. Before the great suburban subdivisions arose on Tammy Road and Sherri Lane and Remington Way, there were more hills along McNamara, covered with winter straw that fertilized spring wildflowers. The delightful quiet as you walked in the valley of the McNamara against those fragrant hills offered any young person a life of hope, for this could be a piece of Heaven itself. In a later season, when I began to drive in the early evening of a warmer spring day, with roll-up windows down since no one had air conditioning, that same scent continued to offer the possibility of believing in the future. Now, many springs later, with so much change in life, in the world, on the McNamara Roads we all have known, though development may be so extensive that such byways no longer seem to be peacefully rural, though the car windows may be closed, it takes just a millisecond to recall what was and a moment to stop the car, take a short walk and note yet another fine spring on a road that still leads to Heaven. This morning I will take a car ride with Anna, and we will have conversation. Never sure where those mutual talks lead, as I draw from a stream of consciousness and the partner usually does the same. That means you are in the current, and it can be fast-moving, it can swirl into a placid pond and linger a bit, it can go over rocks, even waterfalls, and lead to lakes, even an ocean. Much like relationships. Anna and I are riding past Bear Mt., a famous part of a lower Hudson River Valley range and site of the nearly 100-year-old Inn by the same name. I have had other conversations in this area, though not for decades, and the description already given about how both water and relationships proceed or stumble or end or diverge, as nature intended, fits. Somehow you never forget the journey. My Anna, though I am not sure she is truly mine— it is an assumption never to her made though often done — is actually a painting, an acrylic on wood panel, 24 x 24, and we are headed for the members’ show at the Garrison Art Center, a fine gallery that is up Route 9D about five miles from Anthony’s Nose, the mountain that looks across the Hudson at its brother, Bear Mt. Anna will no doubt be shy among better work from far better artists, but she’s in the room, and her friend is happy about that. Good enough. Who is Anna? Maybe my conversation with her will tell me more in a discovery that leads you somewhere, even if to tributaries that are do not extend very far. Anna began as color. 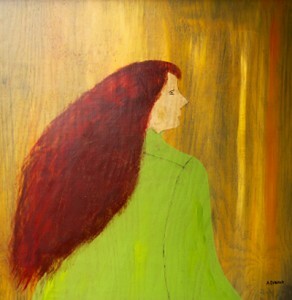 I deliberately chose her green coat, or perhaps blouse, and her Red Irish lass’s hair. She stands against a background of yellow ochre and similar color mixed and applied to show the stain of the wood, far preferable to me than canvas. She might even be in a wood somewhere. Her expression came last, for that is her soul, and we humans only know that in exquisite moments, if we ever see the individual soul at all. I drew her sharp nose, mouth and chin first, guided by intuition, which for me is the ever-deeper well of prior observation. I have seen such line before. When her eye was painted, and the rouge of Anna’s face applied, she was there. I like her. I may even love Anna, not as an art piece, for it may not be that at all, but for the feeling. Off to our car ride now. Who knows where our conversation will lead?